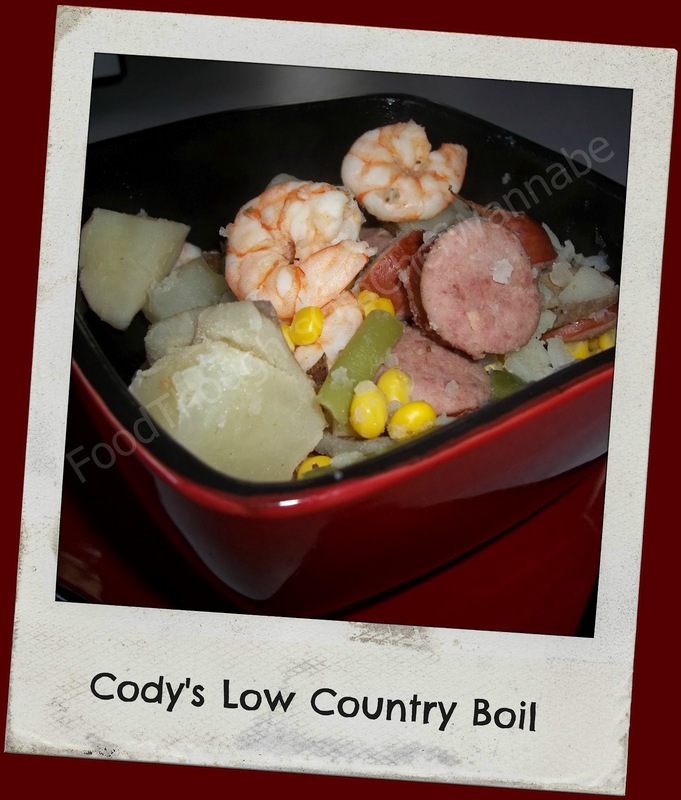 FoodThoughtsOfaChefWannabe: Cody's Low Country Boil Ya'll! Cody's Low Country Boil Ya'll! We had a GREAT time in southern Georgia! Laughter, love, memories, new beginnings, and FOOD! Thank to our son and daughter-in-law for making our visit so warm, oh wait, mother nature did THAT part for us! Anyway, thank you guys for making our trip comfortable, fun, and memorable, we love you both! Is there a reason non of you, my fantastic readers who are from GA didn't tell me how hot and HUMID it was? I mean, I get it, even in Omaha we have horrendous humidity, the kind you walk outside and can't get your breath for a second, but THIS....holy moly, this was some kind of humidity! I broke out in a rash "prickly heat" all over my arms, it was attractive for sure. NOT. It rained almost everyday followed by the sun coming out and slowly steaming us alive! I will never complain about humidity or heat again, never, never, never. Well, at least not until next summer! We had a great time, and visited Savannah and Kellers Flea Market which felt almost like being back in Jersey. On our way back, George even got a North Carolina style BBQ sandwich from "Ida Mae" topped with coleslaw and he was in heaven. In the parking lot was a fresh shrimp tent, so we nabbed 5 lbs and headed home for Cody to prepare us a delish traditional dish from his area. He wants me to let you all know this is not a traditional low country boil. He made it once from what he had on hand, and threw in a few extras and just liked it. He didn't want his daughter to have to dig in her food to eat corn on the cob so he used frozen kernels. He is like me, a big fan of eating certain things all mixed together and on the cob, you can't do that. See he did get some of my traits through osmosis. He also says you can do this with blue claw crabs, or change up the sausage, as he uses Italian and most use just a smoked sausage. Anyway, he just wants ya'll (I use this word any chance I get, HA) to know this may not be your traditional recipe but it is his and he loves it! In a large pot add your water, seafood seasoning and red pepper flakes to a boil. Add in potatoes and sausage, boil for 10 minutes. Add in corn and green beans. Simmer for 10 more minutes. Add in shrimp and cook 5-7 more minutes. Serve in a bowl with the broth. Have some crusty bread on hand to dunk in the juice and enjoy...kind of like this. PS He also made the most amazing crabcakes I have ever eaten. As soon as I get his recipe, you will all get it too!